The first Ideal Org raised on the South American continent opened before an enthralled audience of some 2,500 Scientologists and inspired Colombian luminaries who traveled to the nation’s capital from points throughout South America for the occasion. The grand opening of Bogotá’s new Ideal Org was greeted by thousands in the city’s Usaquen district. Scientologists on hand included those traveling from Venezuela, Ecuador and Costa Rica. A rendition of “Colombia Beloved Land,” comprising both modern and traditional elements, commenced the grand opening ceremonies. Mr. David Miscavige, Chairman of the Board Religious Technology Center and ecclesiastical leader of the Scientology religion, with (left to right): Dr. Sandra Rincón, Advisor to the Ministry of Social Integration, Bogotá City; Lt. Colonel Carlos Peña, Coordinator for Anti-Drug Education, Colombian Anti-Narcotics Department; Captain John Galindo, Operations Director, Circle of Aid Technicians of Colombia; Lt. Colonel Anstrongh Polania, Chief of the Department of Joint Operational Law, Ministry of Defense; and Lt. Colonel Edgar Rojas, Special Ops Commander for Rural Zones, National Colombian Police. Scientologists from across South America joined those from regions of North, South, East, and West Colombia in touring Bogotá’s new Ideal Org. Continuing forward with the historic momentum that’s fueling a period of vast expansion for the religion, the Church of Scientology cut the ribbon on a new Ideal Organization (Org), Sunday July 5, in the bustling city of Bogotá, Colombia. The first Ideal Org raised on the South American continent opened before an enthralled audience of some 2,500 Scientologists and inspired Colombian luminaries who traveled to the nation’s capital from points throughout South America for the occasion. A mood of resolute commitment and passionate unity pervaded the event, which demonstrated a stirring pledge from an impressive cross-section of Colombia’s leadership figures to use Scientology to help foster peace and positive change throughout both the embattled nation and the wider world. Nestled in a high-altitude cradle beneath the Andes Mountains at over 2,600 meters above sea level, Bogotá is a thriving metropolis of nearly 8 million. Its new 8-story Scientology Ideal Org stands prominently on the city’s Calle 100 in the northern district of Usaquen. The ultramodern structure spans 48,000 square feet and sits in the center of the district’s vibrant commercial and entertainment hub. Dignitaries present at the ceremony literally spanned the top rung of Colombian military and law enforcement, with their participation evoking broad acceptance and unbridled enthusiasm. They were without exception impassioned to play key roles in the further embedding of Scientology’s technology, tools and ideals into their nation’s very fabric. Joining the Scientology parishioners and Church officials were Lt. Colonel Anstrongh Polania, Chief of the Department of Joint Operational Law, Ministry of Defense; Lt. Colonel Carlos Peña, Coordinator for Anti-Drug Education, Colombian Anti-Narcotics Department; Captain John Galindo, Operations Director, Circle of Aid Technicians of Colombia (CINAT); Lt. Colonel Edgar Rojas, Special Ops Commander for Rural Zones, Colombian National Police; and Dr. Sandra Rincón, Advisor to the Ministry of Social Integration, Bogotá City. The new Bogotá Ideal Org provides all visitors with an introduction to Dianetics and Scientology, beginning with the Public Information Center. 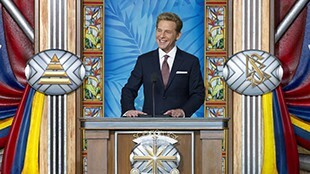 Its displays, containing more than 500 films, present the beliefs and practices of the Scientology religion and the life and legacy of Founder L. Ron Hubbard. The Information Center also offers a detailed overview of the many Scientology-sponsored humanitarian programs. These include a worldwide human rights education initiative; a far-reaching drug education, prevention and rehabilitation program; a global network of literacy and learning centers; and the Scientology Volunteer Ministers program, now representing the world’s largest independent relief force. The Center is open throughout the day and evening for visitors to tour at their leisure and return as often as they wish. Bogotá’s Ideal Org also features a chapel that provides for Scientology congregational gatherings, including Sunday services, weddings and naming ceremonies as well as a host of communitywide events open to members of all denominations. The Ideal Org further includes multiple seminar rooms and classrooms, in addition to an entire floor dedicated to Scientology auditing (spiritual counseling). The Bogotá opening continues an explosive growth period that finds the Church of Scientology operating more than 40 Ideal Orgs across five continents—most recently with the Ideal Org opening in Basel, Switzerland, some two months ago. Indeed, Scientology has enjoyed greater expansion during the past decade than in the previous 50 years combined. And more is on the way, with openings in the coming year planned for cultural epicenters in Asia, Europe and North America.